President Donald Trump’s longtime political adviser and confidante Roger Stone pleaded not guilty in a federal courthouse in Washington on Tuesday, where the veteran GOP operative was arraigned on a seven-count indictment brought by special counsel Robert Mueller. 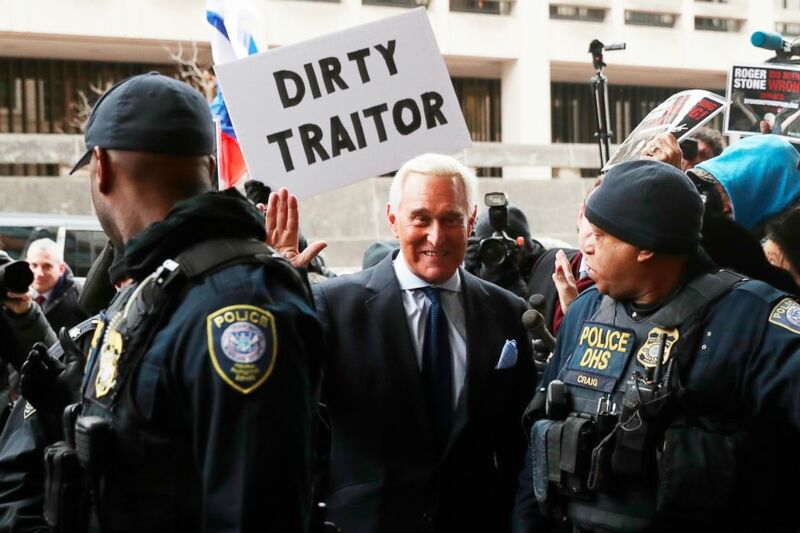 Stone arrived at court Tuesday morning amid a barrage of cheers from supporters and jeers from protesters, who shouted “lock him up” – a reference to chants of “lock her up” directed at Democratic presidential nominee Hillary Clinton during 2016 Trump campaign rallies. The normally talkative Stone spoke only briefly, twice answering “Yes, your honor” and once “I do” when responding to the judge’s questions. He said nothing as he left the courthouse to a similarly raucous scene – with Russian flags flying above the mob scene of protesters and reporters. Stone's predawn arrest late last week marked a turning point in the special counsel's ongoing investigation into Russian interference during the 2016 election. In his 24-page indictment of Stone, which laid out charges of witness tampering, obstruction of justice and lying to Congress, Mueller painted the clearest picture yet of possible collusion between the Trump campaign and Russia. Former campaign adviser for President Donald Trump, Roger Stone arrives at Federal Court, Jan. 29, 2019, in Washington, D.C. The special counsel describes Stone as a conduit between the campaign and WikiLeaks, which disseminated internal Democratic National Committee emails in the summer of 2016. Mueller has accused 12 Russian intelligence officers of hacking those emails, and it's the consensus of the U.S. intelligence community that those Russians "relayed material it acquired from the DNC and senior Democratic officials to WikiLeaks." An unidentified "senior Trump campaign official was directed to contact Stone about any additional releases and what other damaging information [WikiLeaks] had regarding the Clinton Campaign," the special counsel's office wrote in its indictment of Stone. "Stone thereafter told the Trump Campaign about potential future releases of damaging material by [WikiLeaks]." Mueller's indictment stops short of accusing Trump, or anyone in his campaign, of colluding with the Russians or of having foreknowledge of the content of stolen documents prior to publication. The charges brought by Mueller's office largely revolve around false statements Stone is accused of making to the House Intelligence Committee regarding his communications with associates about WikiLeaks. He also stands accused of witness tampering in connection with humorist and radio show host Randy Credico's testimony to the House Intelligence Committee. 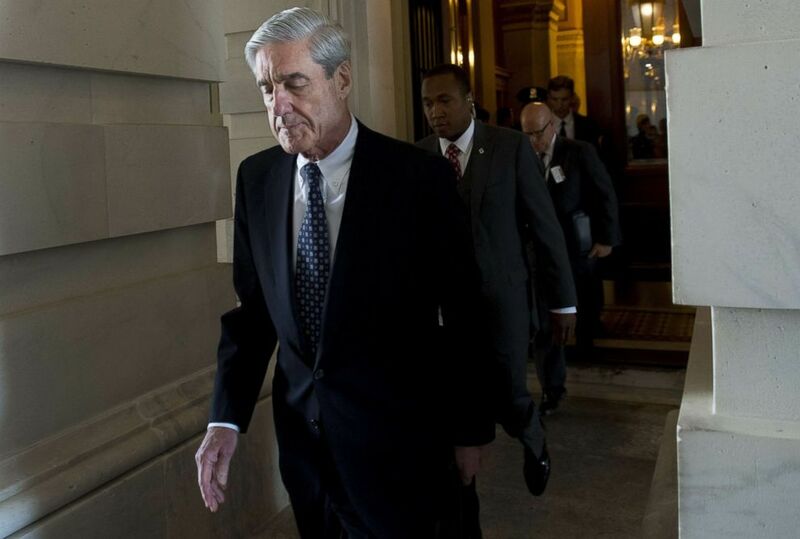 Former FBI Director Robert Mueller, special counsel on the Russian investigation, leaves following a meeting with members of the US Senate Judiciary Committee at the US Capitol in Washington. But in an appearance on "This Week" Sunday, Stone told ABC News Chief Anchor George Stephanopoulos he would not categorically rule out some measure of cooperation with the special counsel's office. "You know, that's a question I would have to -- I have to determine after my attorneys have some discussion," he said on "This Week," when asked if he would cooperate with Mueller. "If there's wrongdoing by other people in the campaign that I know about, which I know of none, but if there is I would certainly testify honestly." Stone said he expects to be "fully vindicated" at trial. If found guilty, he could face up to 20 years in prison. Stone is scheduled to be back in court on Friday for a status conference before Judge Amy Berman Jackson.